IF YOUR SPACE HAS A WALL OR A CEILING, WE HAVE A SYSTEM THAT’S RIGHT FOR YOU. Going ductless doesn’t involve going through a major renovation. Fact is, there’s very little mess at all. Nor does it mean sacrificing your room with a view to a bulky window unit. Instead, a ductless heat pump or air conditioner integrates neatly into your space. It’s mounted high up on the wall, where it’s least obtrusive—and most effective at quietly and gently directing treated air to every corner of the room. In commercial settings, there are options for wall- or ceiling-mounted systems—or even in-ceiling systems. TWO INDUSTRY GIANTS. ONE COMPACT UNIT. More than 110 years ago, Willis Carrier invented modern air conditioning. More recently, Toshiba Corporation invented the variable-speed inverter for ductless applications. Their breakthrough made these units more efficient and amazingly quiet—which is important, because a ductless system is located right in the room with you. By working together, we’ve created industry-leading ductless products for North America: the Toshiba-Carrier series. 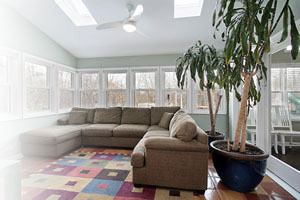 The way we see it, it’s the pinnacle of ductless system design for your home or office. In our opinion, this system is more than ductless—it’s peerless. Designed for unsurpassed cooling and heating comfort, this compact wall system boasts a staggering energy-efficiency rating of up to 23 SEER. And likewise, as a heat pump, it gives seriously impressive HSPF ratings of up to 10.0. Plus it comes with a lot of bells and whistles, despite the fact that the inside unit is whisper-quiet (as low as 26 decibels). It includes a 5-speed fan, a wireless remote—and enhanced summertime dehumidification, thanks to a variable-speed compressor. The Performance series is all about choice. 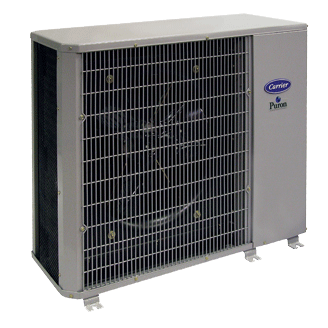 You can choose a heat pump—for cool-season heating and warm-season cooling—or an air conditioner unit. You can even opt for a system that’s designed for open floor plans or multiple rooms. Performance units offer impressive energy efficiency (up to 16 SEER) and ultra quiet operation (as low as 31 decibels). Also, they help dehumidify your treated rooms in the summer months. No matter which unit you select, you’ll enjoy the benefits of a 4-speed fan and a wireless remote. Presenting our most economical way to bring cooling and heating to room spaces you’d like to turn into your comfort zones. Our Comfort series includes your choice of an air conditioner for cooling or a heat pump for cool-season heating comfort. Both offer solid energy efficiency (up to 13 SEER) and impressively quiet operation. This series features a 3-speed fan and an optional extended-range cooling kit so even in winter when most cooling systems can’t operate, you can keep a room that gets too warm comfortable.